You are currently browsing the tag archive for the ‘sweater’ tag. I saw a Duck Soup sample at another yarn shop a few years ago, and have been trying to get to it since. I think this is an ingenious design: it’s a jacket or sweater, depending on the size. Because babies grow so quickly, you’re meant to make it a couple sizes too large, rolling the hood and sleeves for a good jacket fit. 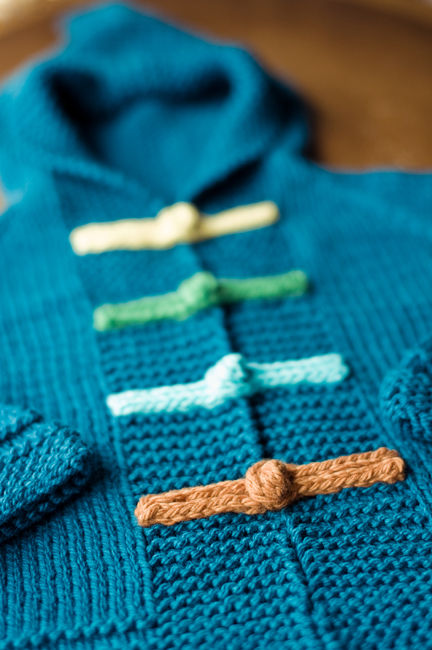 Once baby is larger, unroll those sleeves and it’s a sweater. A cozy, handknit sweater! Economy, meet luxury. Brilliant. I still have not had the pleasure of meeting Neko, the jacket’s recipient, but I hope it’s a gift that he & mom get a lot of use from. 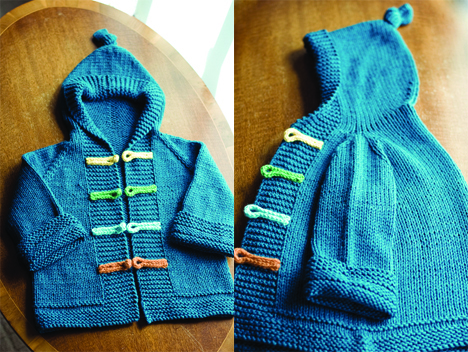 The frog closures were fiddly but fun, and they really made the project. It was a clever pattern, knit from the top of the hood down. The hood was kitchenered up the centre and the knot tied last. It’s too hard to wait for L. when she’s in Victoria and I’m in Burnaby with (finally) some time to knit, so happily started the reindeer sweater by myself. Yesterday I taught myself to knit fair isle so I could start the colourwork – it’s messed with my tension a little but I think it will be ok. It’s exciting how fast you can knit when you’re using needles a little larger than 1mm. C. and I spent Christmas in Summerland, ate delicious food and relaxed with my family. I love it up there. It was really cold, but no snow. 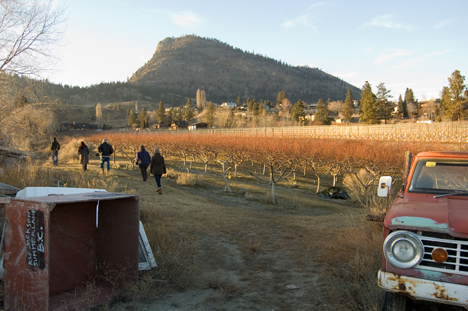 We were lucky to have some beautiful sunny days, including this one below where we all got out for a walk around the orchard. The pink/orange haze in the middle: peach trees getting ready to do their thing in the spring. So that’s it for 2009. It was a somewhat transitional year for me, hopefully preparing me for the big changes coming next year. Happy New Year! I hope it brings health and happiness for all. See you in 2010. 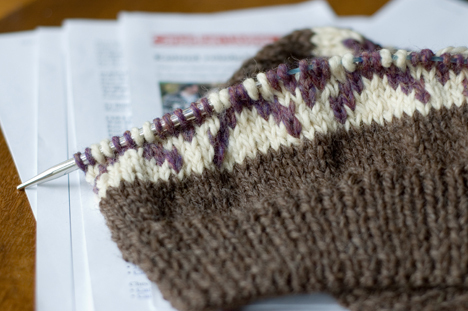 Undaunted, I started on a cardigan called ‘Bianca’ from my favourite Rowan magazine. This one has beads and is knit in a lovely 4 ply wool. Let’s hope I get the tension right this time.